One of the questions I got from my paper on Spinoza and Buddhism on the Self that I gave at the symposium on “Philosophies in Dialog” the other day was that how could I compare Spinoza’s Substance and Nagarjuna’s Emptiness. The issue is a very large one and by itself it deserves a whole project of its own. But here in this blog I can only give a very brief sketch of what I am thinking at the moment. First a little bit of background, Spinoza’s Substance is the totality of everything. It’s the only thing that exists by itself without being dependent on any other. In fact there is no *other* because Substance is the only thing that exists. Other things are just parts of Substance. Another name of Substance is God; another one is Nature. This is the ultimate reference point in Spinoza’s system, the starting point where everything in his thought follows. Nagarjuna’s Emptiness, on the other hand, is not so straightforward. In fact Buddhist philosophy does not seem to want to say anything directly about this totality of all things taken as one big entity. In fact “Emptiness” is strictly speaking an aspect, or one could perhaps say at “attribute”, of this ultimate reality. Reality is by nature “empty” – this is a basic tenet of all schools of Buddhist philosophy. But even though it is considered as an attribute, then I think something interest could emerge when we compare it with Spinoza’s Substance. When Buddhists talk about ultimate reality, it is usually couched in terms of its main characteristics; that is, that ultimate reality is interdependent, always changing, lacking in substance, and so on. This seems to point to a strong contrast with Spinoza’s Substance. If ultimate reality in the Buddhist views “lacks substance” then how could it even be comparable to Substance in Spinoza’s system? Aren’t we then comparing light and darkness, a pair of totally opposite qualities? But things are not that straightforward. For Spinoza’s Substance also cannot be directly described. This is not possible because for a thing to be describable (as, for example, a car is described as a vehicle with four wheels) there has to be a more general concept which is then qualified down to the level of the thing to be described. This is simple Aristotelian logic. But Spinoza’s Substance is the whole totality and “there is nothing greater” (Spinoza’s own words from the Ethics). So it can only be understood through the two possible “Attributes” that we can conceive, namely extension and thought. And even thought it cannot be described we know that it necessarily exists. The Buddhist is not so metaphysical in this respect. Of course there are things like rocks and chairs, but their identity depends on others. I think Spinoza would agree on this point. So the problem boils down to: How would a Buddhist, or Nagarjuna himself, say anything about the totality of everything? What is the equivalence of Spinoza’s Substance in Buddhist philosophy? The Buddhist talks about reality in this sense too. This is clear from the fact that Buddhists often talk about the whole totality of things when they characterize it as being always changing, lacking in substance, and so on. So ultimate reality is whatever that lacks substance, always changing, being such that any part of it is always dependent on others, and so on. This “whatever” is one and the same as rocks and chairs in one way of looking at it, but in another it is not the same because rocks and chairs are always parts of it. One way to look at this is to conceive the totality of everything here as whatever that consists of rocks, chairs, stars and also all mental episodes. This has to exist because there has to be something that possesses those characteristics of always changing, lacking in substance, and so on. And then we need to bear in mind that when we talk of this whatever we are not reifying it. This whole totality also share the same characteristics as all its parts. However, that it is the totality of all things – this is not changing. Or to put it in another way, that it is a fact that all things do change all the time, this fact does not change. And in this point we can, I think, still compare this ultimate reality according to the Buddhist with Spinoza’s unchanging Substance. After all Substance for Spinoza is nothing more that a collection of all things, and all things do also change continuously. It is the whole collection, taken by itself, that does not change. This Tuesday the class on Spinoza was resumed again. It was cancelled last week because I had to prepare for an international workshop (so we have to move the final exam one week further to allow for a make up). Today we talked about one of the most serious problems in philosophy, that is the problem of evil. We tried to see how Spinoza and his concept of God could deal with this problem. And it is a very controversial one. For a review, the problem of evil is how one can explain the apparent contradiction that happens when there is a God who is by nature benevolent and omnipotent on the one hand, and the fact that there are terrible things in the world such as earthquakes, tsunamis, genocides, ethnic cleansings on the other. How could it be that a benevolent and all powerful God could allow such montrosities to happen? Either God is not benevolent, since he allows these terrible things to befall us, or he is not all powerful, since he could not have prevented these things from happening. The standard answer in theology is that we humans have free will. God created a world with evils in it because this would test the love of human beings toward God himself. Love would not be real if it is not tested; that is, if, despite of obstacles and hardships, humans still love God out of their free will. However, this has a problem of having God creating evils in the first place. What kind of God is he who puts obstacles to his creatures to prove that they really love him? Well, I am not a Christian theologian, so I won’t talk any more about how the theistic God fares in the problem of evil. Let us look instead at what Spinoza has to say. According to one of the propositions in the Ethics, there is an astounding pronouncement: Everything there is, is in God, and God’s being reflects an infinite of attributes or properties. This means that everything is in God from the beginning; furthermore, everything is an expression of God himself and partakes of his nature – since God himself is indivisible. This means that the evils are godlike too. There is no place for an evil to be except in God, and as God. This is indeed astounding, especially if one is familiar with the theistic conception of God. So it appears that all the evils are parts of the one, indivisible God or Substance. But according to the standard problem of evil, this cannot be because that would mean that God is not benevolent and because the evils would be contrary to God’s nature. However, for Spinoza his God is totally impersonal. The typical problem of evil occurs when we are kind of let down by God. For someone whose family has just been struck down by a huge tsunami, he might question his belief in God, saying “Why did you do this to me?”. That is, he puts the blame on God for allowing this disaster to happen. But one can no more put a blame on Spinoza’s God than on the water itself when it struck. The tsunami flood is coming to your house forcefully, but do you say to the water, “Hey, water, why are you doing this to me? Why are you flooding me, taking away my possessions and loved ones?” You might continue cursing the water. But everybody knows that this is an absurd action. The water can’t take the blame because it just functions as a result from some prior events, such as a rupture in the tectonic plates undersea. And the rupture is caused by some other events, which can be fully explained by seismologists, and so on. So who is to blame? Do you blame the moving tectonic plates? Or the underground force that moves them? Or any cause of that force? Or the earth itself for having been constituted in this way? All these are absurd of course. But this is Spinoza’s God. You can’t blame him, just like you can’t blame the continental plates for causing the earthquake. These events just happen because they are caused to do so. That’s it. So what can we say, out of all this, for Spinoza’s God and the problem of evil. For natural evils like tsunamis, we say that they are natural events, which are themselves caused by further natural events. And the fact that tens of thousands of people died in Japan a few months ago because of the huge tsunami was just because they happened to live along the coastline hit by the wave. We do feel very sad for them, and if we are the Japanese directly hit by the wave, then we feel much more intensely. This is totally natural. But there’s no one to blame. Everything happens because the causes and conditions are such and such. When we understand this, we feel that there is less need to find someone to blame, which is not useful to anybody. Instead we focus our energies to helping each other in the time of need without worrying ourselves why the disaster happens to us and not to others or why a benevolent supreme being could do something like this. And this is Spinoza’s way toward blessedness. We lead our lives totally in accordance with reason. But what about the problem of evil? Spinoza would say there is no such problem. The “evils” are so because of our own limited perspective. This does not mean that the evils deliberately perpetrated can be condoned, such as the man-made evils such as the Holocaust, Pol Pot’s killing fields, and so on. We should do what we can, in fact we have to, in order to stop those evils, but there is no denial that they are parts of the natural order too. This make them real and palpable, all the more reasons for us to fight and defeat them. Last Tuesday I taught a course on Spinoza for the first time. It is part of the course on Modern Philosophy, starting with Descartes and supposedly ending with Kant. Spinoza figures prominently in this story, and his thought is the most interesting of all the philosophers in the modern period, or in any period for that matter. We read Spinoza’s Ethics together in the class, trying to understand what is meant in Spinoza’s terse, geometrical language. As one who has only a little familiarity with Spinoza’s thought and writing knows. Spinoza presents his masterpiece “in geometrical order” meaning that he emulates the style of Euclid when he presents his philosophy. This is perhaps the only piece in the history of Western philosophy which is presented as axioms, definitions, propositions, and proofs. And the subject matter is not about points, lines, triangles, or squares, but God, substance, attributes, modes, human emotions, in short everything dealt with in any other substantial philosophy. Spinoza’s most startling insight is his idea that God is everything. He does not say this as a metaphor; there is no place for metaphors in the Ethics. He means this literally. A standard theistic understanding of God is that he is the creator of the world, so he cannot be everything because that would mean that he is one and the same as his creation, but that is exactly Spinoza’s point. God is a “cause of itself” — he creates himself, and he is the only one entity in the whole universe who does this. In fact it is the universe itself that is God himself, or it is God himself who is the universe. Being a cause of himself God in fact has no beginning because that would mean that there has to be something that exists before God which acts as his cause, but that would contradict the statement that God is the cause of himself. Since God has no beginning, he does not have an end either. Heady stuff, huh? Western interpreters tend not to interpret Spinoza so as to make him appear a mystic, but in the context of Thailand and other Asian cultures Spinoza makes for a very interesting, if very difficult, read. People naturally tend to compare his thoughts with the major philosophies both in India and in China. We talked about Brahman and the Tao as something comparable to Spinoza’s God. 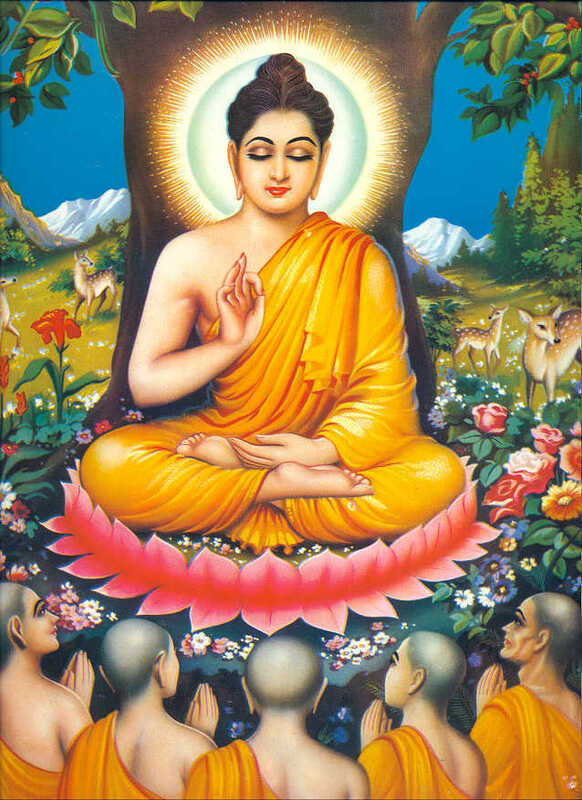 In Buddhism we can certainly compare him with Emptiness. Emptiness is everything too. Well, it is both everything and nothing at the same time, but Spinoza’s God is like that too. We also talked about Spinoza and the pre-socratic philosophers, most notably Parmenides, with whom Spinoza shares a lot of things in common. God is certainly one, and for Parmenides the substance of everything is, well, “The One.” Scientifically minded western philosophers tend to make fun of Parmenides, saying things like “Oh, Parmenides taught that everything is one, and that I am not it.” We can certainly say the same thing about Spinoza’s God. Someone might say, “Spinoza says that all is one, that is God, but I am not He.” But as I said before Spinoza has an answer to this in his view about the infinity of God’s attributes. But you might wonder how can God be one if I am God and you are God and that I and you are not one? But in Spinoza’s vision you and I are one. You and I only appear separate from the point of the view of the finite intellect, but from the infinite point of view you and I are certainly one. This is the Buddhist perspective too. Each of us expresses God’s attribute in a different way, but deep down we are both a part of the infinite whole that constitutes God, or nature. As the infinite whole has no real parts, there is absolutely nothing that separates you from me, or me from you. 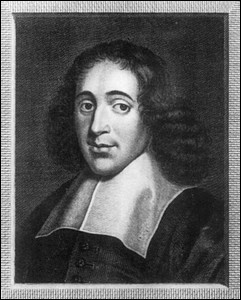 Spinoza uses his vision of God here as a basis for his thinking on ethics, especially on how we humans could achieve “blessedness” in our lives. But that will take us too long. So let’s wait until I talk with my students again next Tuesday.